By Jennifer Burcke on August 6, 2012 Visit Jennifer's Website. Imagine that you live in a small one room apartment without indoor plumbing. Living with you are your closest friends. You dine together in this space. You sleep in this space. You go to the bathroom, when necessary, in this space.It’s not the prettiest of mental pictures, is it? Yet, I’ve just described the state of affairs within the four walls of a chicken coop. Even with access to the outdoors, chickens spend a lot of their time inside the coop together and leave the evidence behind to prove it. We have seven heritage breed hens living in the main coop at 1840 Farm. They eat, sleep, and lay eggs there. They spend their days outside soaking up the fresh air and sunshine. They stretch their legs, take dust baths, and enjoy picking through the vegetation that grows nearby. Every evening, they return to the coop and take their place on the roost until the next morning. We do our best to keep their coop clean and tidy. 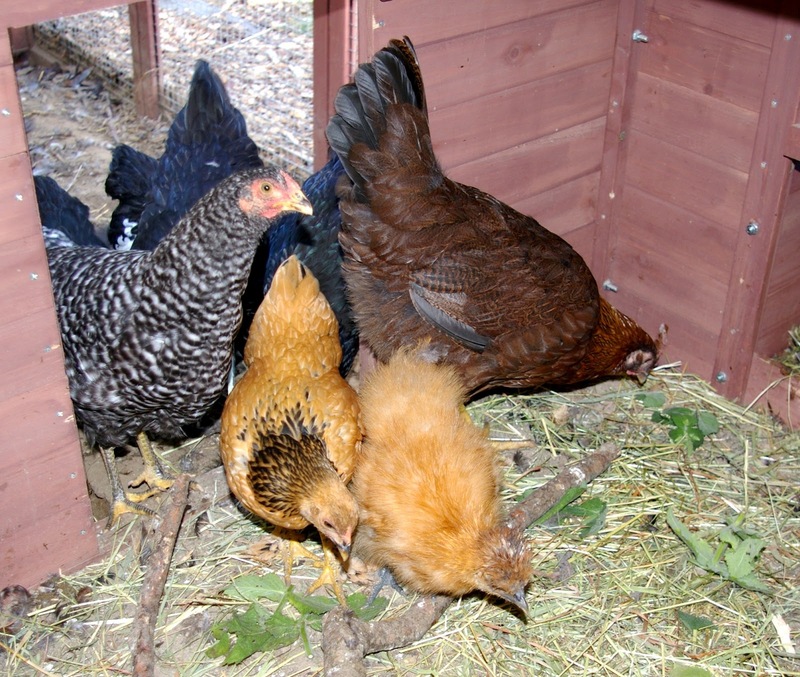 We make sure to provide them with more than the recommended square footage per hen, but a coop is still a coop. Hens live, eat, and sleep there. What they do in between these activities is their business. At the same time, their business is my responsibility to clean up. Sometimes, when the sun is shining brightly above the coop and the temperature inside rises just enough, there is a hint of aroma that announces the reality that chickens live there. It’s not unlike our barn in that respect. Most of the time, the aroma is of hay, feed, and a fresh New England breeze. However, sometimes, a farm just smells a bit like, well, a farm. I’m a farmer. I expect a little mess and aroma to come with the job. I’m not afraid of getting dirty; in fact, I find it to be a badge of honor on the farm. If I don’t end the day with dirt beneath my fingernails, I must not have been working very hard. If I’m not working very hard, then there will be less homegrown food on our farmhouse table. Bring on the dirt. As much as I have made peace with the realities of keeping chickens and goats, I don’t have to like the smell of the coop or barn on a hot summer day. Luckily, I have found a few ways to bring a little freshness into the equation. Using these simple techniques, you can keep your coop just as fresh as ours. 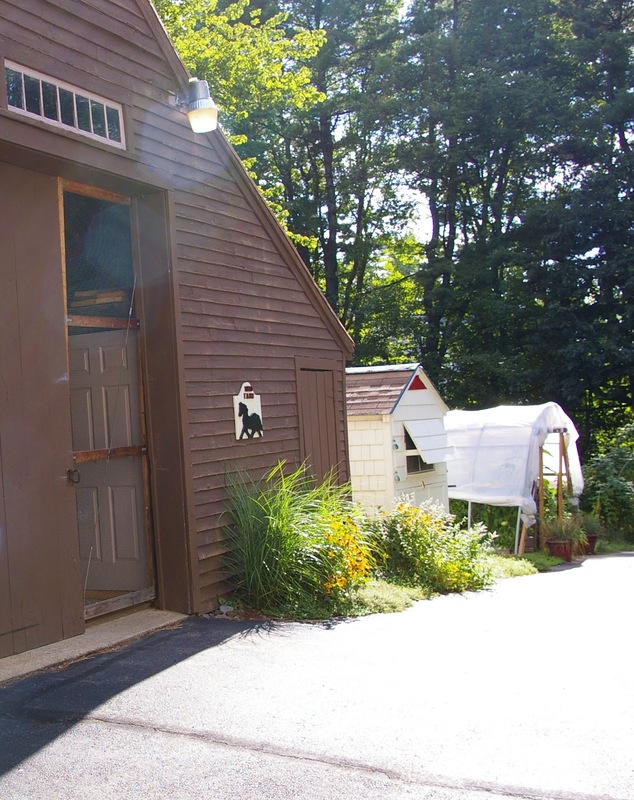 During the summer, our coop and barn are open and ventilated all day. I’ve already discussed how important I believe cross ventilation is to the health of a flock. Our front facing window and rear facing vents and access doors help to keep fresh air flowing into the coop. 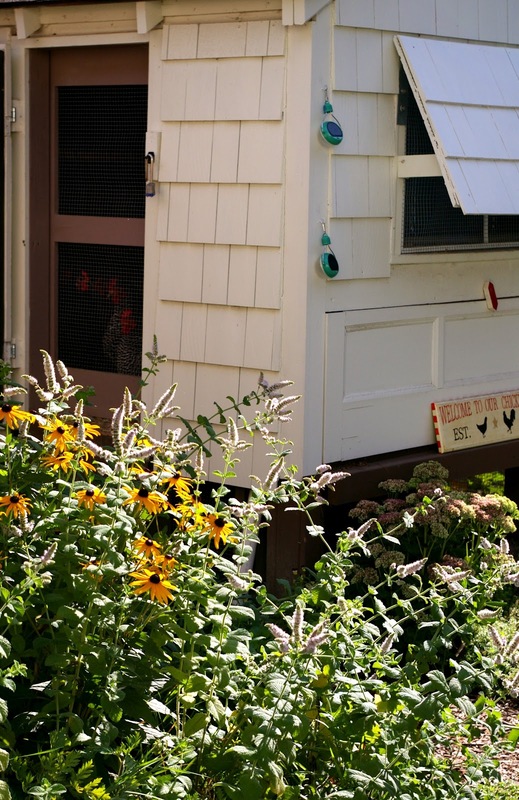 The side screen door is also kept open during warm weather, allowing even more fresh air to enter the coop. We follow the same method of keeping air circulating in our circa 1840 barn. Each morning, I slide open the south facing front door and unlatch the screen. Then the back door is opened and secured to keep it open and allow a breeze to flow through the main aisle.Keeping a coop smelling fresh is a big goal and a breeze can only do so much on a hot, humid day. 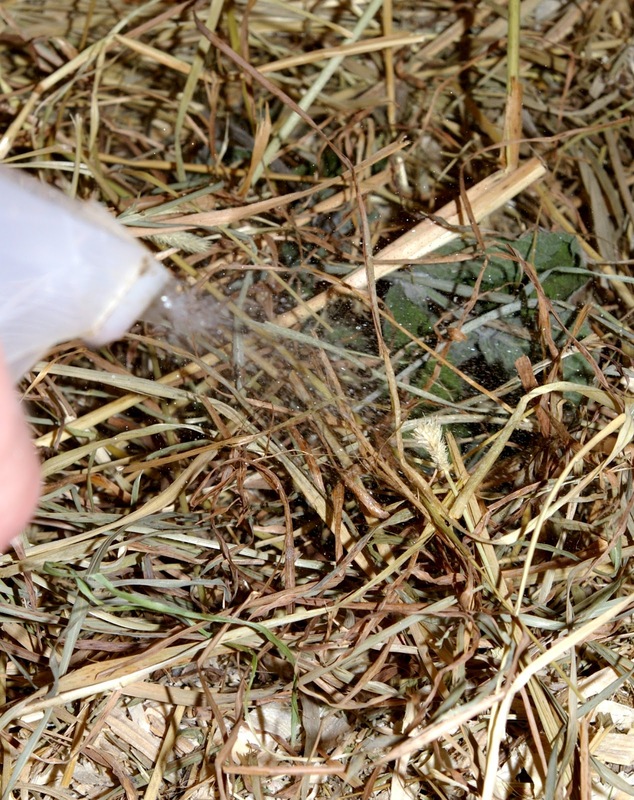 Regular mucking and cleaning is the most laborious and also most successful way to keep a coop or barn smelling fresh. Even with our drop down cleanout door, a total coop cleaning takes a sizable time commitment, not to mention the need to have a large quantity of replacement bedding on hand. While I don’t want to disinfect our coop on a weekly basis, I have developed a Sunday routine that enables me to freshen the coop in between deep cleanings. 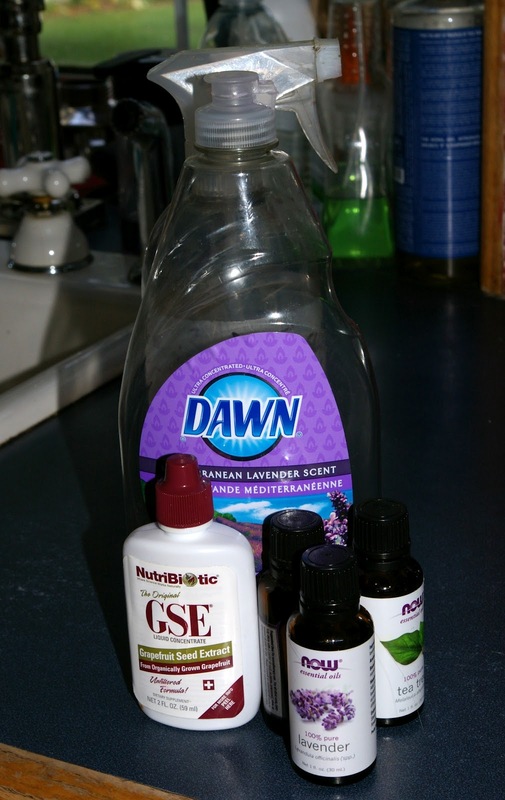 My weekly coop freshening takes only minutes and uses supplies that I always have on hand. Even better, it leaves our coop smelling fresh and clean even on the warmest summer day. I chose the components for my spray carefully. I use Dawn lavender dishwashing liquid soap both because of its lavender scent and its known gentleness and effectiveness to clean birds in the wild. If it can be trusted to be used during the crisis of an oil spill, then I feel like it is safe to invite into our coop. You could certainly substitute another brand of soap when making your spray, but I can only attest to the effectiveness of Dawn as it is the only brand that I have used. Lavender Dawn has a lovely, light lavender scent, but I wanted to up the ante. I also wanted to boost the power of this spray to both lightly disinfect the coop and help to deter pests. I always have grapefruit seed extract on hand for making household cleaners and knew that it had incredible, natural powers to help disinfect yet it was safe enough to be taken internally. I don’t have any plans to feed my chickens grapefruit seed extract, but I feel safe adding it to our spray. Then I add tea tree oil and peppermint oil for their insect repelling qualities. Lastly, I add a bit of lavender to help boost the calming properties of the freshening spray. Every Sunday, I enter the coop after completing my morning farm chores ready to freshen the coop for the week. I come armed with my homemade coop freshening spray and a small bucket of herbs gathered right outside the coop door. Mint grows directly outside of our barn and coop and we seem to have an unending supply. Using it to freshen our coop and barn seems like a great way to use it to its full advantage. I spray each nest box with the herbal spray several times. Then I lightly spray the bedding on the floor of the coop and also the two roosts. 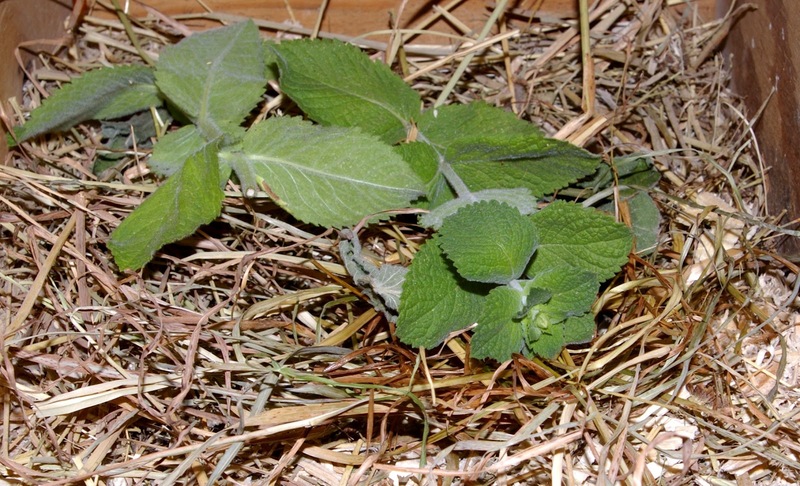 I place a handful of fresh mint on top of each nest box. If the nest boxes need a little bit of nesting material, I add it after spraying the boxes with the herbal spray and before adding the fresh herbs. Even on a hot day, the coop immediately smells fresh and clean. Over the period of the next few days, the herbs I have left behind in the nest boxes continue to perfume the air in the coop. Occasionally, I add a handful of mint to each nest box during the week as I am collecting the day’s eggs. Both our adult laying hens and adolescent pullets seem to enjoy their freshly smelling coops. They immediately come in to investigate their freshened surroundings. While they sometimes take a closer look at the mint, I have yet to see one ingest any. Instead, they seem content to nest on top of them and enjoy the aroma of mint in their coops. While I felt as though our hens appreciated my efforts, I wanted to test my theory. One week, I only freshened a single nest box. I left the remaining boxes untouched and didn’t spray the floor or roost. I placed a handful of mint on top of the lone freshened box and exited the coop. Later that afternoon, I went out to the coop to retrieve the day’s eggs. Every egg that had been laid was in the same nest box. They were sitting on top of the fresh mint leaves as if I had placed them there for effect. Clearly, our hens did appreciate my weekly freshening services. The fact that they decided to lay their eggs in the only nest box that I had freshened confirmed that. As a chicken keeper, there was no bigger affirmation the hens could give me. Collecting enough fresh eggs to feed my family was all the encouragement I needed to keep me coming back to freshen the coop every Sunday. How do you keep your coop fresh? 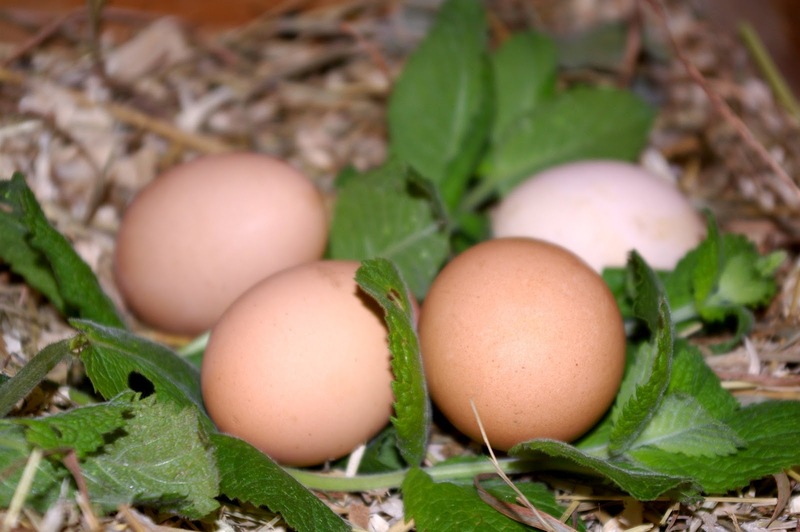 Do you add herbs to your nest boxes to encourage your hens to spend more time there? This sounds like a great idea. I am going to try it tomorrow after I pick up the ingredients. During the hot summer days it would be refreshing to smell this fragrance rather than a birdie outhouse. I know they will love it. Thank you so much. Love this spray, though I did not have grapefruit seed or lavender eo; substituted lemon and clary sage, oh and used Dawn Simply Clean (cannot get the lavender flavor where I live). It is DIVINE! For those who may be reading this in the future and regarding cedar oil comment….cedar oil products meant for use on cats have had the phenol removed. You can’t just use any cedar oil or any essential oil for that matter that contains phenols on your cat. And no cedar oil around chickens. Ever. I used the ingredients you listed and made up the spray today. It has a lovely aroma..I’d like to use it in my house! As hard as I try to keep coops clean (we have about 43 chickens) unless you change the litter every few days it’s gonna stink. I put “litter boxes” (I think they’re really used for animal feed but they look like a litter box just a bit bigger you can get them at Tractor Supply in the horse section) under the roosts to make it easier to dump the litter and clean up. I also put shavings and branches of herbs in the litter boxes as well as the nesting boxes. Thanks for the recipe. Any ideas for a natural wormer that works without having to withhold eggs? TEA TREE OIL is a definite no no if you have cats and certain breeds of dogs; deadly toxic to their liver. Jenifer@1840 is right about the cedar, OK in cooler weather, but heat of Summer can cause respiratory problems. We grow Pennyroyal along with catnip to sprinkle in the nests and coop. The gals love it; the guys, not so much. Regarding the cedar (the oil) it’s toxic to chicks I wouldn’t suggest it. and the other question about cleaning the roost. I have wooden roost, I take a gloved hand pick up a hand full of sand (our beding) and rub the roost, nest boxes, walls were ever there is poo. Works great. I’m going to try the herbs and prob a spray too. I’d love my coop to smell like lavender or mint! Don’t you rinse off the soap? I would think that after a while, a soapy residue would build up. I put fresh herbs in my nest boxes. Most of the time, my girls lay their eggs under the nestboxes, so I put herbs there too. I use lavender, basil, thyme and rosemary because that is what I have growing. They do not like the lavender in the nestbox. It gets thrown out. The rest of the herbs they leave alone. This is used to freshen the coop. What do you use to wipe it down? Roosts etc? I haven’t had any problem with a soapy film. I do not wipe or rub it off. I haven’t had any problem with residue in the coop. I use it weekly and even spray it directly on the roost without issue. I’d love to hear if the film dissipated as the spray dried in your coop. If not, perhaps you could dilute it slightly by adding a little water to the mix before using it again. Either way, I hope that you’ll let me know how it ends up working for you. I used the spray, but it seemed to leave a soapy film. Do I rub it off with a damp cloth after? That would defeat the purpose wouldn’t it? Thanks for sharing your technique. I actually do enjoy the smell of sage. I have quite a bit of it growing in our garden and will have to give it a try in addition to the mint! In an effort to more frugally replenish the straw on top of the wood chips in my coop this summer, I cut down a lot of wild Timothy grass growing over the septic leach field. They enjoyed getting the seed heads. When that ran out I began to cut the soft green sagebrush and other sagey-smelling plants. In my view, anything without stickers in it will work (barring poisonous of course). Laying it out in the sun dries it in a day because sage is a strong smell. I use the leftover straw to mulch everything else with so I don’t want weed seeds – so I pick them before they form seeds. (Timothy grass is ok). Sage is not a lovely smell, but it is a clean smell. Once I’m back to wintering over with straw I’ll be happy to try the lavender spray! You’re welcome! I can’t wait to hear what your hens thought of the mint and basil! Great-I hope that it works well for you and that you will report back and let me know what you think after using it. Just bought all the ingredients and plan to put it together tonight for use tomorrow. Thanks for the information. I don’t see any reason why you couldn’t use those herbs. I have added lavender in the past with good results. We have sage and thyme growing right outside of our coop and have never had any problem. I hope that you will let me know how it works once you give it a try. I’d love to hear all about it! Soleone, I have always added aromatic herbs to my henhouse bedding– including everything on your list- with great success. They keep things fresh, repel flies & external parasites, as well as giving my birds more things to nibble. Many of these herbs work as a natural vermifuge. When I attend events with other chicken breeders, where we sell pullets, my carriers full of herbal bedding are the only ones not surrounded by flies. Can you suggest herbs that chickens would like in their nest box? 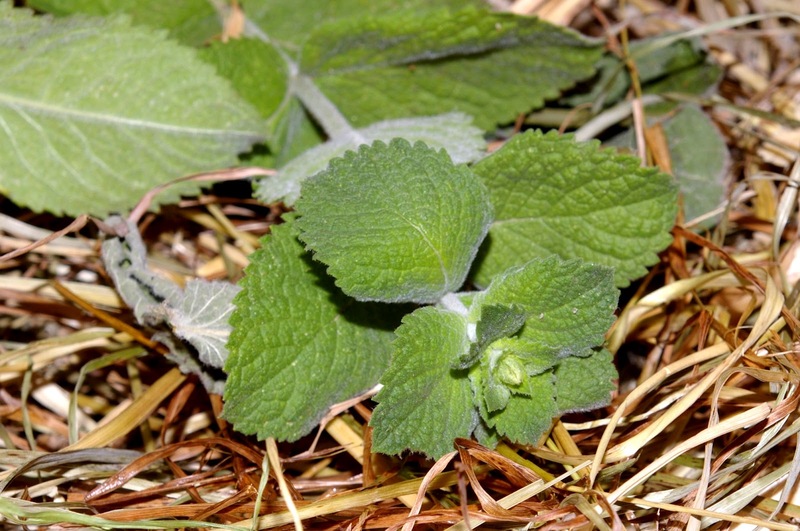 We don’t have mint, but we have lemon balm, lavender, borage, hyssop, and various culinary herbs, such as rosemary, oregano, marjoram, sage, and thyme. We did give them some nasturtium once but it wasn’t a big hit for them. I have never used cedar in our coop. Cedar can be very irritating to the airways of chickens. In a warm coop, the aroma from the cedar can become overpowering and cause enough irritation to harm a flock. From everything that I have read, tea tree oil provides many of the same protection from insects without risking a respiratory issue. For that reason, I have always used tea tree oil instead of cedar. I don’t have any chickens now, but they may be in my future. I’m wondering if anyone has tried cedar oil – I use cedar oil (Cedarcide, but there are other brands) for my cats, who are inside/outside pets. Cedar oil kills stinging/biting insects (including ticks, fleas, mites and chiggers) and is safe for humans and pets. But I don’t know if this applies to poultry. I don’t use any chemicals on my pets since it is said to shorten their lives by 25%. I don’t know if this would work with chickens, I haven’t done any research on this. I would be curious to see if this is a viable alternative. I don’t see any reason why you couldn’t use lemon and spearmint oils. In fact, I hope that you will report back and let me know how it works for you! How do you think lavender Dawn, GSE, tea tree, lemon, and spearmint oils would do? That’s what I have on hand and I REALLY want to try this! I can’t wait to try your citrus based spray-it’s been on my Pinterest board and to do list for far too long! I think that you’ll find that the Dawn lavender is fragrant enough to freshen the coop without being overpowering. I can’t wait to hear what you think of it. I do add herbs to my nesting boxes. I also use a DIY spray that is citrus based but I am going to try yours. I have never heard of the Dawn lavender scent but its on my shopping list.